← ….. and then a Dung Beetle rolled by! With hardly a fat-bottomed girl in sight, the bicycle races came east of Málaga yesterday, for the Vuelta Ciclista a Andalucía – one of Spain’s biggest cycling events of the year. 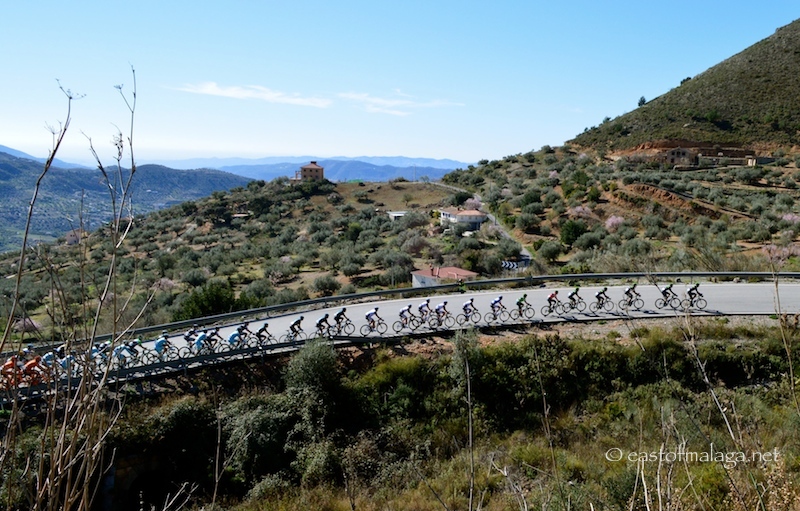 The 60th Ruta del Sol takes place between February 19th and 23rd, with the peloton travelling through eight Andalucían provinces, covering 733.7 kilometres across five stages. Think of it as a mini-version of the better-known Tour de France or the Vuelta a España. After the Prologue in Almeria further east along the coast on the 19th, the first stage started yesterday in Vélez-Málaga at 11am. The day’s racing (the second longest at 187km) culminated in Jaén at the Castillo de Santa Catalina, passing through Zafarraya and Alhama de Granada along the way. You’ll remember I wrote about the old railway line at Zafarraya recently, and this area seemed like a good place to view the race as there is a steep climb for the riders within the first hour of the race. We positioned ourselves at about 700m elevation with a splendid view of the spectacular U-shaped Zafarraya Pass, as well as a great view of the series of bends below, along which the peleton would travel. The weather was glorious, with hardly a cloud to interrupt the blue sky. The sun shone and you can see the almond trees in blossom nearby and the surrounding mountains to complete a perfect picture. There was plenty of activity with the passing of Guardia Civil vans and motor-cyclists, as well as lots of pleasure cyclists (if you can call it a pleasure, cycling so far uphill!) vying for the best position to see their heroes. We didn’t have long to wait before the leading group of riders came into view. Click on any of the images to get a better view. There were nineteen teams, each with seven riders taking part, including Team Sky led by Sir Bradley Wiggins, former Tour de France winner, who sadly I never spotted. All was not lost though, with all that testosterone wafting by in the form of young men wearing tight lycra! So, within a couple of minutes of first spotting them in the distance, the peleton of La Vuelta Cyclista a Andalucía had passed by. They were barely out of breath. No huffing and puffing for these guys. OH NO! Bringing up the rear came the various support vehicles carrying spare parts and bicycles with the customary ambulance in case of medical support. On your marks, get set, GO!!!!!!! This entry was tagged Andalucía, cycle race, cycles, Cycling, East of Malaga, Europe, Malaga, photography, Spain, sport, travel, Vuelta, Vuelta a España, Vuelta Ciclista a Andalucía. Bookmark the permalink. As long as he likes cycling uphill, though!! I’ve often thought that the Zafarraya road was the most stunning road to cycle along (at least on a good day). Part of me envies them, the other part thinks cycling is such a pleasant and gentile sport to watch its a shame to get so sweaty to enjoy it. Were there any kooky spectators like you see during the bigger cycling events? The road to Zafarraya is the most stunning road at any time – with spectacular views not only of the Pass but towards the Mediterranean, too. I’ll give these guys their dues – they are supremely fit. Barely broke out into a sweat. Love this song. I was listening to it on my iPod at gym this morning. 🙂 Fantastic photos, Marianne. I couldn’t get the song out of my mind whilst I was writing the post – so I just HAD to include it. How exciting! That opening shot, Marianne, is spectacular! Such colour and life in these photos, and the beautiful landscape backdrop. You captured the atmosphere so well, I feel like I was there. Not so easy getting those shots, as I know from an attempt to catch runners during a marathon. Those bikes whizz by very fast! Must`ve been exciting to watch though! I had a bit of a practice at getting the fast shots when I was watching the F1 winter testing in Jerez a few weeks ago – and I managed to find the “continuous shooting” mode! They do like their bicycles over there, don’t they? We often have to hop nimbly out of the way 🙂 Great shots, Marianne. It’s great bicycle country, Jo – plenty of hills to test them out. Oh, what a let down! I admire these bikers! Cars have to work extremely hard to get up there…. This is one of the few sports I watch (on TV) 🙂 Great shots, Marianne! Amazingly, these guys got up there in half the time it took us to get there by car! Incredible. We so enjoyed our time cycling in Picos de Europa. However I looked nothing like these fellows and spent a great deal of time gasping:) Love this post. I was gasping just walking up the hill a few hundred metres to gain my vantage point. It would have been a long wait for someone if I had been cycling to this point!! That made me chuckle. I played the game on my bike…see how slow you can go before you fall over! Hmm pleasure cycling definitely does not involve the word “uphill” for me! Looks like it was a lot of fun to watch. Phew, I got tired just imagining it. Great shots what incredible fitness levels these guys have! Marianne, looks like you had a good day. Some good photos too. Great Pics Marianne, it really is lovely up there, Thank goodness for Chamois leather ! !